Google+ Reading Teen: OMG Bitterblue (Graceling) by Kristin Cashore!!! OMG Bitterblue (Graceling) by Kristin Cashore!!! Kristin Cashore just made my life! Today on Kristin's Blog she FINALLY announce the release of Bitterblue. For those who don't know, Bitterblue is the companion novel to Graceling and Fire. Graceling is an amazing book, and more importantly :) my favorite book (next to Harry Potter, of course)!! I've been waiting for this news for SO LONG, and I just can't believe it's finally coming!! 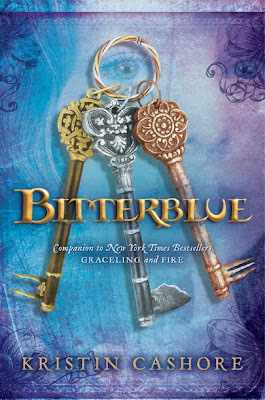 Bitterblue will be released May 1, 2012, which seems forever away, but I'm just so happy there's a date!! It'll be here before we know it! Bitterblue is a whopping 576 pages, and begins 8 years after Graceling ends. Bitterblue is the queen of Monsea, and Katsa and Po will be returning (YAY!). Bitterblue can be ordered NOW, which I have already done!! If you have not read Gracling, I can't recommend it enough! READ IT NOW!!! What do you think (LIVIA!!!)?? Do you like the cover? Are you excited for the release? I think the cover is awesome, and fits in really well with the other two books. I admit I like the foreign(?) covers for the books a little better (especially FIRE), but I still love them all. I just can't believe it's actually happening!! I was beginning to think the day would never come! The only way I could be more excited was if the book was in my hand!!! I AM SO EXCITED FOR THIS TOO. I love how the covers match! I wasn't that much of a fan of the US covers (I mean just look at the UK covers! ), but this really complements them. And I can't wait to read Katsa and Po's cameos. Looking forward to seeing what trials Bitterblue'll face. Ah, well, I'd read anything Kristin Cashore. Such a brilliant author. *Flails* OMG OMG OMG OMG. There's even A COVER. SO EXCITED> AHHHHHHHHHHHHHHHHHHHHHHHHHHHHHHHHHHH. That is a great cover, but I, like you, am so excited to have a date for the next one. YES! YES! FINALLY! I CAN'T WAIT! I loved Graceling and can't wait to read more about Katsa and Po! O-M-G! That was the best news of the week!!!! I'm SO EXCITED!!!! Nearly 600 pages, deliciously long you have to agree with me, right?! O-M-G! I freaked out when u sent me the tweet. I can't believe it's finally coming out. We've been waiting for it for like, almost 3 years, right? Extremely dangerous high expectations... I know I shouldn't but I can't help myself! Can't wait. ^^ I love Kristin Cashore's books. And the cover is gorgeous. Yay, can't wait :D Thanks for sharing!